If you’re like me, you love the change of seasons, but it’s not always fun or convenient to find ways to exercise your dog in the winter, especially when the days are shorter and it gets dark earlier. For those of us that live in the northern United States, wintertime walks can be beautiful sometimes, but it’s usually all about cold fingers and toes, bitter wind in your face, slush covered dog bellies and trying to stay vertical on icy surfaces. It’s no wonder we sometimes skip the daily walk and stay inside by the fire with a hot cup of tea. The winter months can be hard on our pets too. When they spend more time indoors, they’re not as active and tend to gain some excess winter weight. The Association for Pet Obesity Prevention estimates over half of all dogs in the United States are overweight or obese and have an increased risk of injury, disease and shortened life expectancy. Although your dog may look comfortable sleeping by the fire like a hibernating bear, they would rather be engaged in some exercise or fun activity with you and it’s important that they maintain a healthy weight and get daily exercise. Like people, dogs can also get cabin fever during the winter months if they don’t get outside or exercise as often which may lead to problem behaviors such as excessive barking or destructive chewing. If you hate walking your dog in the winter on those bitterly cold days, here are some other ways to physically and mentally exercise your dog. Play fetch using a long hallway or open basement or play tug-of-war. Play Find It by hiding small treats or dog food around the house for your dog to locate with his nose. Most dogs love playing Hide and Seek which also reinforces bonding and the Come command. Chasing games are popular with most dogs. Try pulling a stuffed toy attached to a rope to get your dog into prey chasing mode. If your dog is young, healthy and not prone to hip problems, throw a ball or toy up to the top of carpeted stairs for an aerobic game of fetch. Just be careful not to overdo exercising on the stairs. Use food dispensing balls or toys with dry food to have your dog work for his dinner. If you feed wet food, stuff your dog’s dinner inside a Kong toy and freeze before feeding. Dog or human treadmills work well to exercise your dog. Start slowly with your dog on a leash and use high-value treats as motivation. After your dog is comfortable walking slowly, gradually increase the speed to a trot. Always stay with your dog to watch him closely. Never tether your dog to a treadmill or force him to stay on it. If your dog doesn’t seem to enjoy the treadmill, find another form of exercise. Try some new training techniques or reinforce any existing commands or training that need more work. Teach your dog some tricks. If your dog already knows the basic tricks, try teaching him something to help out around the house, such as picking up his toys and putting them in a basket. Most dogs like to learn something new and it’s a great way to bond with your dog. Sign up for an obedience or training class with your dog or try indoor agility, flyball or doga (yoga with your dog). It’s exciting for your dog to get out of the house and good socialization. These gyms are popping up all over the country and if there’s one close to you, they offer various ways to exercise your dog. Some even have swimming pools and indoor dog parks. Take your dog out to the pet store and while you’re out, shop at some other dog friendly retail stores or coffee shops. Check for dog related events in your area where you can take your dog along with you. Get together with friends who have dogs that want to exercise, play and socialize. Better yet, host a play date in your home and make some homemade dog treats for your dog to share with his friends. Check out 10 Easy Ways to Find Dogs for Play Dates for some tips. If your dog gets along well with other dogs, doggie daycare is a good option to help keep your dog fit over the winter. Make sure to check out recommendations and tour the daycare center first so you’re comfortable with where your dog will be hanging out and playing. If you really hate walking outside in the winter or don’t have enough time to exercise your dog, hire a recommended and reliable dog walker. I hesitate to mention allowing your dog to chase a laser dot around the house, because some dogs can become obsessed with light and shadow chasing, but it works for some dogs and dog owners. If your dog becomes overly fixated on the laser dot, find another form of exercise. Besides, it’s more fun if you participate and interact more with your dog while playing or exercising. If you love the snow and cold weather, try these 5 fun ideas with your dog. Head out for a hike in a wooded area after a fresh snowfall. It’s beautiful and serene since most people don’t take advantage of hiking trails in the winter. It’s also the perfect time to do some off-leash hiking in areas where your dog can have more freedom without running into too many other dogs or people. Have your dog join you for some childhood fun in the snow. If your dog gets overwhelmed by crowded dog parks, try visiting in the winter when there are fewer people and dogs at the park. 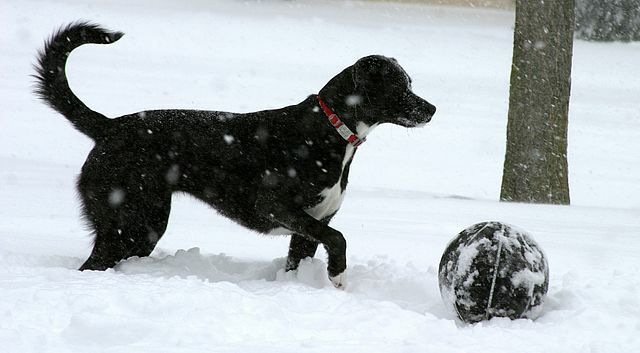 Enjoy these sports if you have a snow-loving dog. If you haven’t heard of this, it’s having your dog pull you through the snow while you’re wearing skis. It sounds like a lot of fun if you have a snow-loving dog that can safely pull you. Tips to keep your dog safe and comfortable when it’s cold outside. Short-haired, small or elderly dogs may need a sweater or water-repellent coat to help keep them warm. Trim the hair between your dog’s toes to reduce snow and ice buildup. Dog booties can keep paws dry and free from ice, salt or de-icing chemicals. If your dog hates booties, apply Musher’s Secret wax to his paws before going outside to prevent painful ice balls from forming between his toes. Musher’s Secret also protects paws from hot pavement or beach sand in the summer. If you don’t use booties, clean your pup’s paws with a warm wet cloth when you return home to remove any salt, de-icing chemicals or ice balls. Also wipe down their legs and belly. Use reflective wear or clip-on LED collar lights if you walk outside after dark. Consult with your vet if you have any concerns about exercising your dog outside when it’s cold. Prevent hypothermia and frostbite by watching your dog carefully for signs that they’ve had enough of the cold. If your dog is shivering, whining, slowing down or lifting their paws a lot, it’s time to head back inside and warm up. On those occasional winter days when it’s just too miserably cold for you to spend time outside, it’s probably too cold for your dog too. Stay inside by the fire and enjoy your hot tea. 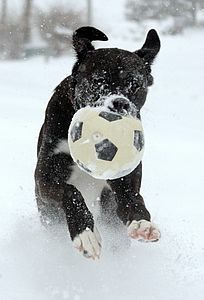 Do you have a favorite way of exercising your dog in the winter? For you lucky dog owners that live where it stays warm all year around, how do you exercise your dogs when it’s extremely hot outside? What a great list! You should join up on our FitDog Friday Blog Hop this week and share this – our readers would love your tips! Thanks, I look forward to participating in the blog hop. Great ideas! I’m trying to think if there’s anything else I can add (after living in North Dakota/Minnesota for 30 years), but you pretty much covered it! Ace and I definitely took advantage of indoor obedience and agility classes in winter. We also worked on lots of training and played games indoors. Since I’m a runner, taking my dog running vs. walking also helped us both stay a little warmer in winter. Plus, we covered more distance in less time. Also, I’ve found most of the dog coats don’t really do a whole lot for warmth. They’re mostly just cute. But if you go to a sporting goods store and check out the section for hunting dogs, you can usually find some really warm, high-quality vests. Sure, they’re not as cute but they really do keep the dog’s core much warmer. Great idea for checking out dog coats at a hunting store, I would imagine a lot of other coats are more of a fashion statement than functional. I bet you don’t miss the snow and ice too much, sunny San Diego sounds wonderful! A snow hike with Atka and Mauja would be a lot of fun! Oh yeah, we love winter! It gets to -40 here, and stays that way for months on end! So love winter, or leave! We skijor. Lots! Check out mushing supply companies for dog coats as well! That’s where you find the warm ones! Thanks for stopping by Kevin! I really enjoyed checking out your blog and learning more about skijoring. I would love to try it sometime. I kind of feel like a wimp now complaining about cold weather, -40 degrees for months on end, yikes! Great list. I hate cold weather. But Honey loves it so much I can’t bring myself to keep her inside. I also love the fact that we have the whole town to ourselves. Honey gets lots more off-leash time when there’s no one else around. I bet is an adjustment having grown up in the south. Come late January and February, all of us Ohioans will be dreaming of coastal Georgia, sunshine and warm beaches. Thanks for stopping by, Beth! There’s so many outdoor activities to do in the winter. The fun never ends! Awesome tips! We love the snow and cold and are far more active in the winter than we are in the summer, but lots of humans don’t love the winter like our mom does. We are the odd ones in the neighborhood that are out walking at -20! Thanks for joining the hop! What awesome advice! I don’t like the snow and cold since it makes my paws cold and ickie so I have been playing a lot more inside to keep active! Great list of tips! We already love doing so many of these things. Lucky for us we don’t have to deal with too much snow in Atlanta, but a snow hike does sound like fun! Thanks for visiting, Diane! Hopefully Atlanta doesn’t have any bad ice storms this winter. Excellent tips. Once hunting season is over, we plan to get back to field training. That is a great way to keep the dogs in shape over the winter. Thanks, I bet Thunder, Storm and Freighter stay in great shape all winter long. My dog Ace loves a good puzzle, so I use washed food containers (they kind you throw away/recycle) to create various challenges to get to the treats. I’ll fill a box with treats or toys and tape it closed so he has to figure out how to get into it. I use egg cartons, styrofoam shells, nut cans, etc. It’s cheap, and he can tear it up as much as he wants! ***Only works if your pup knows not to swallow inappropriate items. That’s awesome and Haley wants to know if she can come over and help Ace out with some of those puzzles, lol! I never thought about using egg cartons or styrofoam containers, but Haley would just love those instead of the usual cardboard boxes. The last thing I tried was a long cardboard wrapping paper tube at Christmas this year. Thanks for sharing that great point about this only being good if your dog doesn’t eat the container too. ?